Normally we overtake other cyclists on the road, we are finding that we are overtaken by others in Holland. The cyclists here are very confident and fast through intersections and the cycling infrastructure supports the flow. We are not used to riding with so many other cyclists. 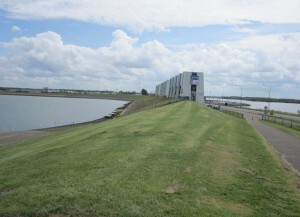 We are also finding the Dutch people are very helpful if you look as though you need directions. Today a lady stopped her car and jumped out to come and help direct us out of Groningen. 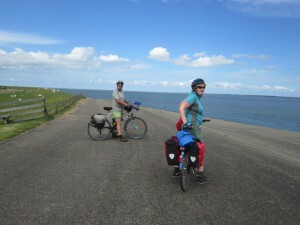 Our Friesland country ride today took us from Groningen to Waaxens – 83km in all. We were cycling against the wind again, especially in the afternoon. Our ride featured lifting bridges, windmills and canals, beautiful manicured gardens, woolly sheep and of course Frisian cows. 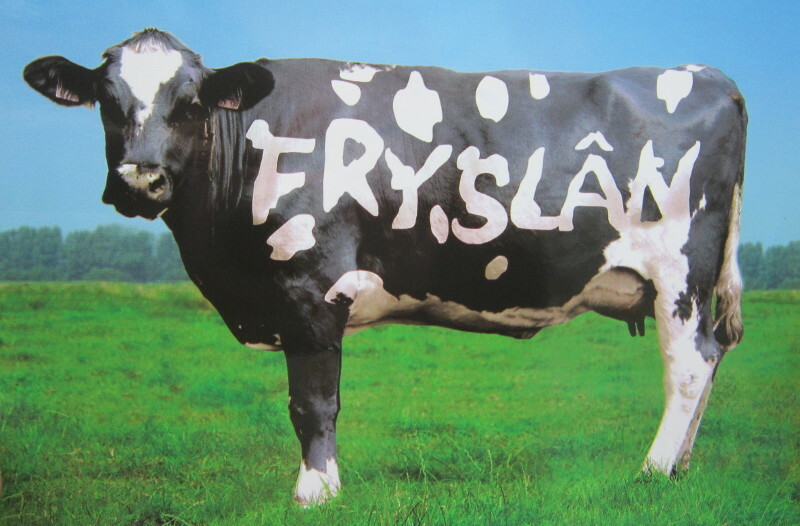 We are loving Friesland – it is has its own unique beauty with the wide flat horizon, bright green and blue shades – and incredible cloud formations in the skies. 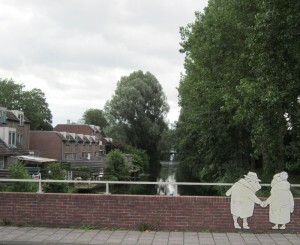 This bridge and canal scene are on the outskirts of Groningen. Note the bike path goes over the lifting bridge alongside the road. 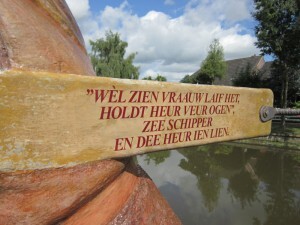 After finding our way out of Groningen we passed through the small towns of Zuidwolde and Bedum. We heard the carillon bells sounding as we left Bedum. 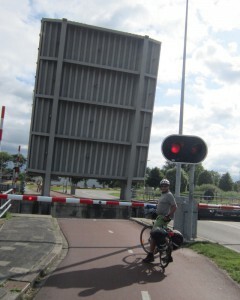 Then we went on through Onderdendam. 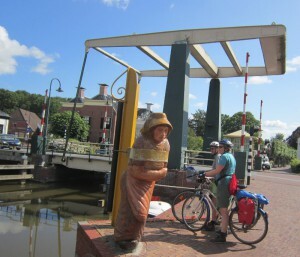 We were interested in this statue beside the canal at Onderdendam. 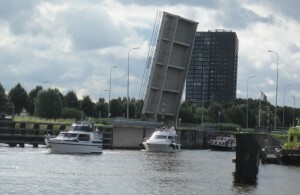 It is the image of a skipper woman who drags a barge. We could not read the text on the drawstring as it is an old dialect. I looked it up later and it means “He who loves his wife loves her in sight,” said the skipper, and put her on the line). 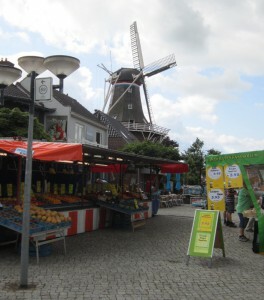 We stopped for a coffee at Winsum, which also had an outdoor market and a windmill. 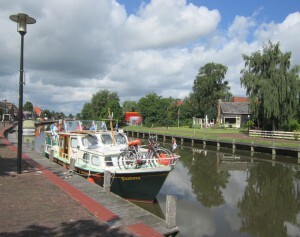 Then through Warfhuisen, Vierhuizen, Lauwersoog, Anjum, Moroa (cute village) to Dokkum. 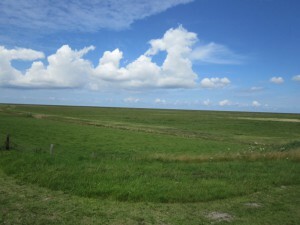 We rode past the Lauwersmeer – a huge inland lake surrounded by marshy nature reserve – between Vierhuizen and Lauwersoog. 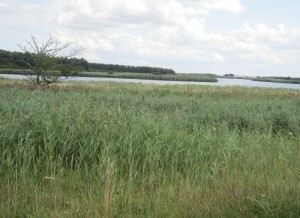 We crossed over a dike separating the lake from the sea at Lauwersoog. We stopped to do some shopping in Dokkum, the biggest town before our accommodation. 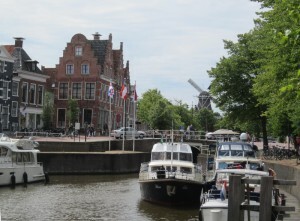 Dokkum has a wonderful town centre, with terrace cafes alongside the main canal. 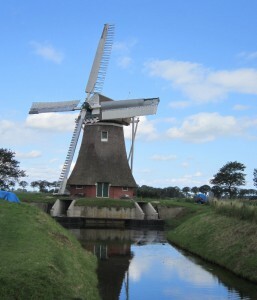 It also has the only old windmill that we have seen actually turning. 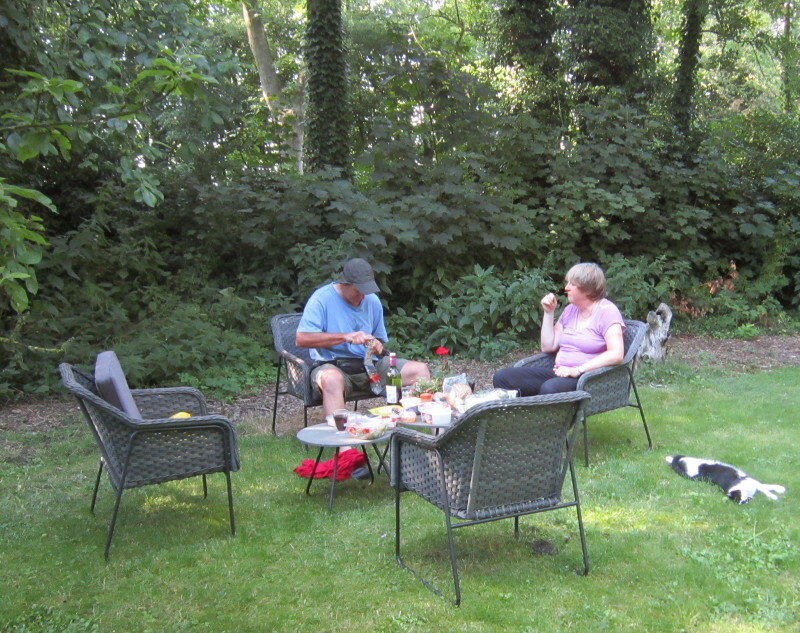 Our accommodation was only about 10km outside of Dokkum at Waaxens. It is called “Pastorie Waaxens” and is in a renovated “pastorie” – or priests house, next to an old church. 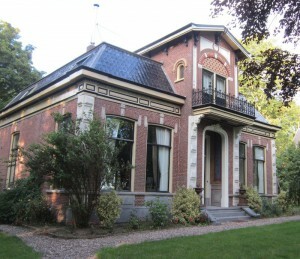 There is not much else in Waaxens, but the house and garden are beautiful. We had a picnic in the garden and our host brought us blankets and a candle once it began to get chilly.